I have a lot of friends in California. And some of them visit me, especially the group that I call "the car guys" who buy and sell cars at the Barrett-Jackson in January. And whenever my California friends visit, Phoenix looks different to me. The first thing that I start to notice is how empty, and wide-open, the roads are. In my suburban neighborhood in Glendale, there are very few cars parked on the streets. In the areas of Los Angeles and San Francisco where my friends live, this is beyond amazing. If you've ever drive around for hours in the Bay area looking for a parking spot, you know what I mean. I often give directions as a passenger and I include comments like "change lanes - when it's safe to do so". Then I glance over my shoulder and realize that there isn't a car for blocks in the next lane. If you've driven much in LA, it's more like being in a NASCAR race than anything, the cars are so close together that they seem to be drafting (if you know racing, you know that term). Some of my California friends have gotten on the freeway and wondered if it was closed? That is, so few cars that it looks as if the highway patrol has closed off the freeway somewhere. If you've ever gotten onto an LA freeway and it was clear sailing like that, chances are that the freeway entrances have been closed because of an accident, or something. No, it's just three o'clock in the afternoon on the 101 freeway to Scottsdale. Many of my friends wonder how I survive in a place that appears to them to be nothing but dusty tumbleweeds rolling by. In my neighborhood there aren't 13 variations of different sushi restaurants, and that makes my California friends kind'a sad. Sometimes when I'm history adventuring, way out in the middle of nowhere in Arizona, and see a few scattered houses, I imagine that's what my neighborhood in Glendale must look like to my California friends. I've been away from California for so long now that I just take Phoenix for granted. But after my California friends visit, I see it with new eyes. I like it here. 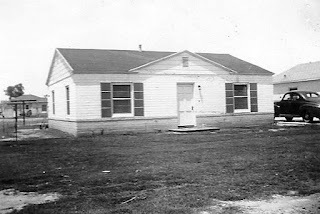 Image above: a house in Phoenix in the 1940s. I like it here too. No disrespect to LA but I would go out of my mind if I had to commit in that city. I agree - I love to visit LA, especially in the summer, but I could never live there! The only town in LA that ever tempted me was Seal Beach. But then you see the housing prices and the fact that you'd have to leave it every day to go to work. Pass! Absolutely! I know a lot of people with nice big houses in California who spend all of their time working to pay for them, and barely get a chance to enjoy them!